Now we know why the football hierarchy is all fingers and thumbs when it comes to making delicate decisions about the game - the boys spend much of their spare time in the fantasy football world of Sony PlayStation. Michel Platini’s fears that introducing goal-line technology would lead to “PlayStation football” is the second time in a week that a top football figure has drawn an analogy between the real game and a video game. However, while Platini made a negative connection, Chelsea boss Carlo Ancelotti, in describing in-form striker Florent Malouda, as a “PlayStation footballer”, inferred that the Frenchman’s similarity to the mini-me version of himself was a good thing, and I have to agree with him. Before I continue, I must confess that I don’t own a PlayStation, though I do have a Wii, and routinely get thrashed by my 10-year-old son on his FIFA Soccer game, even though he plays kick and rush and I take the tiki-taka approach favored by Spain and copied, with varying degrees of success, by my home-town club, Arsenal. Shoot, why don't you! Unlike a real life ref, adjudication in a video game is not subjective. The virtual reality ref is never unsighted. He (if indeed it can be described as a he) is always up with play. He never gets winded and remains on the ball throughout normal time, extra time, penalties, and indeed replays, of which there are many in my house as Dads have egos too you know. A video ref is never influenced by the crowd or the fame of the players he’s refereeing, nor intimidated by the status of the coach. A player’s reputation never goes before him, as the virtual ref treats everyone the same, be they a Nigel de Jong style tackler or a fleet-footed Lionel Messi clone. He’s also oblivious to the importance of the game and feels no more pressure officiating the World Cup Final between Brazil and England (I can dream can’t I?) than he does taking charge of a friendly between Bowlegged Wanderers and Twinkle Toes United. A video ref is never conned by a diver. He’s unconcerned with intent, and doesn’t award spurious penalties based on a whim. And, of course, he never needs to confer with his assistant, who may or may not have been 50 meters behind the play or distracted by a fan in the front row questioning his parentage. He’s also consistent in his decision making - the rules are the rules, the electronics are the electronics, end of story. What’s more, to endorse his decisions in the event of a goal, video games have an instant replay facility so there can be no Frank Lampard-style faux pas. In short, a PlayStation ref is perfect, while a real life ref, even if there’s more than one of them, is not. So Platini’s negative analogy is questionable, unless he’s got shares in Xbox that is. Platini has shown once more that he's an idiot who belongs in a museum with the rest of FIFA dinosaurs who lead the institution. Replays and goal-line technology are precisely the tools that a referee needs to keep-up with modern football and TV coverage. Adding referees is a low-tech approach that only adds more humans subject to make mistakes and that instead of solving controversy it will add to it thereby failing to solve the existing problems. Goal-line technology and replays will not delay the games any more than the theatrical displays of players and, on the contrary, it will keep the game going on a fair level of competition to ensure that there are no unfair and costly referee calls that can ruin an entire season or drive a nation mad with anger as it happened to both England and Ireland in the past World Cup and during the qualifying rounds. Of course, the technology should be used wisely so that it is not subject to irrational use. For example, video replays should only be used for crucial calls that have direct bearing on the game outcome, like dubious penalty kicks and red cards. Dubious goals would be taken care of by goal-line technology. Another option would be to allow club coaches to have one chance per half to dispute a call, just like they do in American Football, and to request a video replay to confirm or revert the ruling on the field. If the coach is right he would not be charged but if he is wrong one substitution would be taken away from his team. Therefore, he could only request the review if he still has substitutions available. This way, coaches would think twice before requesting a review. While the play is in review by the fifth official the game would continue so as not to stop its momentum. Another rule that needs to be reconsidered is the offside rule. Many a good plays are stopped because of this rule or because referees make the wrong call. Perhaps it's time to consider applying the offside rule only to players inside the box. That would extend the playing area where players can move the ball around without incurring into an offside penalty. This would add to the thrill of the game and it would surely result in more goals, which I'm sure we all want to see. Best regards. I must confess, i am not a huge fan of goal line technology and part of me thinks that the controversy caused by bad refereeing decisions over the years is why football has grown so big. Imagine the millions if not billions of hours spent by fans and pundits discussing the controversies over the last 100 years. Therefore if technology allows for 100% correct decision making, what will there be left for us to talk about? Sure, i understand that because of the money envolved and the pressures of modern day top level football, the consequences or rewards of wrong decisions are huge, and so i suppose we should do something. However, I am not a fan of either Platini or Blatter and the way they are running football. Football is the fans game and i guess, they should both ask the fans what we want. Afterall, without us, there would be no football! Great article! Totally agree with Terry Badoo on this subject! Pls get those old fifa clones out of the house. I support goal-line and electronics. Considering that FIFA is in a mess with corruption issues and that Sepp Blatter has been under the microscope by investigative reporters for corruption, I would say that the only good thing to come out of FIFA is the world cup. Anything else is dubious and quite frankly a curtain over our eyes so we dont see their dirty business. Blah blah blah, Platini. 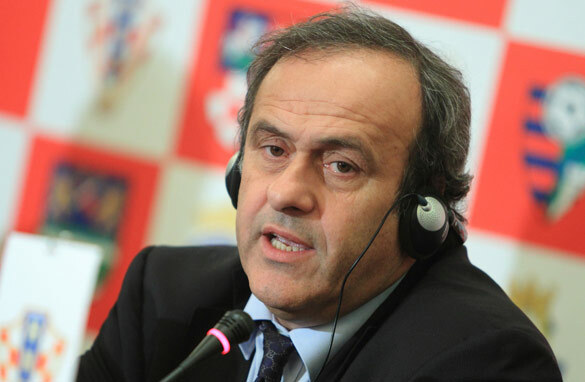 I dont care for suits in FIFA and you, Platini, are a hipocrit. A former footballer who becomes a suit and backstabs his former footballers demanding better refereeing. brilliant article but the problem lies with the officials. UEFA and FIFA are too stubborn to give up their point of view even though they know that they are wrong. Even when a player seems like he does not deserve a red card or yellow card UEFA and FIFA justifies the bad decision of the refree. Seriously its not the referees who's responsible for this it's FIFA!! !